I’d brought a Hershey’s Chocolate kiss to give to Paul. It was a large bit of chocolate in a pink box with large blue lettering that read “A Big Kiss for You.” I’d tried getting close enough to give it to him before but unfortunately the opportunity never presented itself. Tonight I was bound and determined for results! I was contemplating just what I’d say as we sat in the lobby of the hotel. He’d used the elevator yesterday and we expected him to do this again today. He surprised everyone by using the stairs (to our right) and in less than a second, we flew over to the stairs. It was myself, Doylene, Marie, Barb, Mary Ann, George, Shelia and Mar. As if we alone weren’t the equivalent of a crowd, well, you know how it is when Paul enters onto the scene. Everyone under the sun materializes. He was on the escalator then in front of us, so we just hopped on too! The award winning ham we all know and love was waving and posing for everyone at the bottom of the escalator. Once he laid his head on the railing with his arms out and pretended to be sleeping. Linda had gone on ahead, which she’d been doing the whole of the tour. Doylene hopped off the escalator and her camera case dropped. She spent the next few minutes chasing it down the pavement. He started to walk down the tunnel to the coach and it was here I decided was the moment of truth. 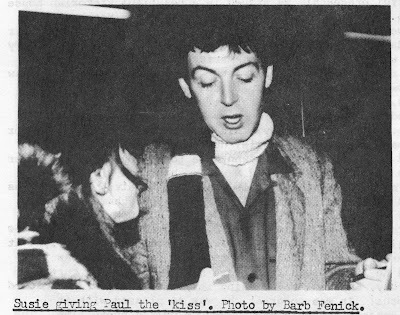 Paul had been signing autographs so when I trembled up to him he smiled at me and stopped walking and poised his pen. I held the chocolate kiss out to him and asked, “Paul, could I please give this to you?” He smiled and looked me in the eyes and replied, “You sure can” and looked down to take it from me and then looked up at me again, continuing to look me dead in the eyes. It was like this through the whole encounter and it was divine! He has these magical light brown eyes. Schmaltzy but so true! I explained why the box was marked on one side. It had been in my camera case at the show on the 28th and forgetting, I stood on the case to see Paul better. “I accidentally stepped on it at the concert trying to see you but I wanted you to have it. I’m sorry.” You’d expect him to burst out laughing, but on the contrary. He was dearly charming and so very sincere. He replied, “Well, don’t you worry about it.” I took a step back and smiled and looked down and he walked away. I couldn’t move. I watched him walking away with my hands to my mouth, half laughing from blissful hysteria when I see Paul look down at the kiss, reading the print on the box. He stopped walking and turned around and looked at me. He smiled at me, that all knowing smile, and winked. I found my feet finally and charged outside, my chin dragging the pavement. He’d already got on the coach and I heard Barb call out, “Susie, he’s looking at it!” I ran next to her to get a look and he was saying something, showing it to Laurence, who was sitting across from Paul and Linda. Laurence looked at it and smiled and Paul set it on the table and leaned back. He closed his eyes for a second and then popped back up in his seat, opened it, closed it and sat back. Someone in all that confusion, Barb got his autograph too, which I had missed. Mary Ann took a picture to capture that moment. It is nice to have snaps of the memories. The Piccadilly and not the Midlands Hotel? now that's the common touch. I absolutely LOVE these kind of stories! That's why I subscribed to several fanzines at the time they were running. I happen to know every one of those fans, can't remember a Sheila or a George though. Thank you, it brought back many memories of seeing "the boys"! Lizzie--I am pretty sure the "George" in this story is George Tebbins. He is in some of the photos from this day. Ok, thanks! I remember him from Beatlefest, bought many of his fabulous photos. I am guilty of doing that... In the late 60's I asked the boys for autographs for many of my pen-pals all over the world, and for my friends in Brazil, especially Denise (Paul) and Regina (George) who got several. If I'm not mistaken, I asked John for his autograph 16 times for myself! HI MS. LIZZIE - HOW'S THE ENGLISH BOOK COMING ALONG? Hi Anonymous! There is no translation at the moment, I just did a few chapters. Will get back to it when real life allows me. Thank you for your interest.